You most likely have oil, balsamic vinegar, and s+p kicking around your kitchen, so do yourself a favor and buy some brussels sprouts on your way home. You won’t be sorry. Not a balsamic fan? There are endless variations of this recipe. For example, I was all set to make these on Monday night, got them sizzling in the pan and discovered I had only about a tablespoon of balsamic vinegar left… so I threw in a quarter cup of a mustard-y vinaigrette I had made a few days earlier instead, absolute perfection! You could do something with port, citrus, the options are endless. After making them with balsamic vinegar last night I was hooked… I may need to eat these every night until I want to vomit at the thought of them. Pair these delicacies with a side of Amy’s Spaghetti Carbonara and you’ve got yourself a great meal! This entry was posted in Anniversary, Brussels Sprouts, Quick & Easy and tagged balsamic glaze, balsamic vinegar, blue hill, brussels sprouts, Dan Barber, side dish, vegetable. Bookmark the permalink. 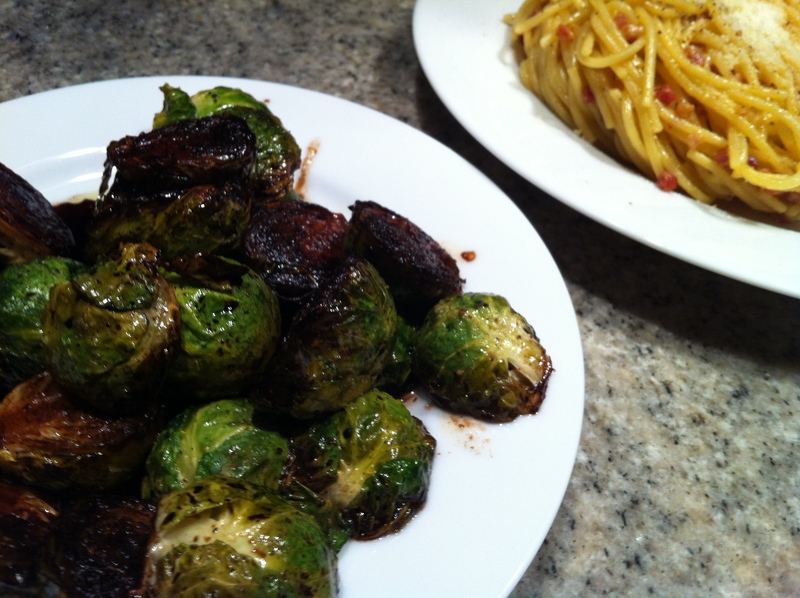 1 Response to Quick Balsamic-Glazed Brussels Sprouts: Revisited! I love this recipe – it is a go-to after a long day at work. Happy anniversary ataleof2kitchens!